4.) the very finite level of resources present on earth forcing upon us to live by the 5,000 year reduce, recycle, and reuse rule. Sustainable prosperity is an intelligent way for everyone to have ample sufficiency as well as abundance (prosperity) in the vital areas of life and to have this prosperity sustainably over the long term. But there is much to unpack in this definition's specifics to really understand it. To achieve the Sustainable Prosperity goals stated and its definition, Sustainable Prosperity would eventually need to utilize the total and individual productivity of ALL of humanity to create and maintain itself and its supporting biological and physical environments. the initial satisfaction of basic physiological survival (nutrition, shelter, warmth, basic health care, etc. ), security and safety needs in ample sufficiency (police, army, courts, etc.). a stabilized maintenance for all essential humanity-supporting ecosystems (biological species, diversity and habitat), and physical systems (clean air, water, productive soils etc.) To do this will also require new verifiable and enforceable international laws that cause every environmental polluter to pay the full cost of their pollution and cleanup. Currently polluters externalize the costs of their pollution by passing them on to taxpayers within the nation and human commons. The new verifiable and enforceable international pollution laws will have to insure that this can no longer happen and all pollution costs are always internalized to that polluting individual or organization. If this was done today, they can no longer burden or destroy the common spaces, the collective wealth, and collective well being of both individuals and humanity as a whole! All pollution economic advantages to any entity anywhere in the world must be equally punished with standardized, painful fines and restitution charges. This is done by mandating all other verification and enforcement actions needed to insure compliance with these new International laws. the establishment of adequate special reserves and surpluses (building redundancies and system resilience), to maintain basic group physiological survival and safety needs relating to natural disasters, accidents, mistakes and other unpredictable "black swan" emergencies. the utilization of all waste products through reusing and recycling (or sequestering if needed), to renew and replenish appropriate resource stocks and systems. This will naturally increase profitability for individuals, organizations and nations adapting the no un-recycled or re-used waste policy. create additional surplus and reserves to offer assistance, charity and protection for care of the ill, the incapacitated, handicapped, or elderly who truly are no longer able to be productive in fair and appropriate exchanges with others and the society. These surpluses and reserves would be created by improved or sufficient individual, group and national meritorious productivity. a.) We need to live within natural or functional limits of nature. Growth is not limitless on a finite planet or in a finite universe. The popular free market principles of "growth economics," which are based on the theory of endless economic growth andinfinite resource substitutability in the closed resource system of the Earth are in fact a dangerous delusion that will eventually bring about local, national and global collapse. b.) There are inherent and intrinsic evolutionary interdependencies and interconnectedness in life in a particular environment, economy and society. The universe in which we in all of our systems exist is truly one single union and the "text for which no other context exists." Because we are all embedded in the one universe union, our sustainability practices must also reflect this reality. c.) There needs to be appropriate and fair distribution of technology, information, opportunity (access) and resources within and between the parts of any given grouping based upon merit, fair exchange and essential basic need. Without this distributive justice element active within a Sustainable Prosperity grouping, sooner or later Sustainable Prosperity practices will break down. d.) the universe's evolutionary principles for successfully sustaining life have been proven over billions of years of trial and error testing. The Sustainable Prosperity principles have been drawn directly from how evolution has successfully sustained individual life and groups over its history. e.) Sustainable prosperity eventually deals with the excesses of extreme wealth and extreme poverty because unless this energy distribution imbalance is corrected it will be difficult if not impossible to establish a true Sustainable Prosperity for everyone. Applying the actions recommended in this Sustainable Prosperity online booklet as well as by applying the Universe Principles (which will be presented later in the booklet) will naturally and gradually help rectify the unsafe, unhealthy and inherently unfair energy imbalances of extreme poverty and in extreme wealth. When we say Sustainable Prosperity for everyone, we mean all individuals. But we do not mean that some individuals can freeload or steal, abusing the goodwill of a productive social group or community. Sustainable prosperity will not exist for long unless both individuals and groups are highly productive. If an individual is of able body and sound mind, can be productive and be in fair and appropriate meritful exchange with others for their work --- they are part of the definition of ALL! This also implies that the social group may and should also provide support for charity situations for the truly infirm, disabled or elderly from the surplus and reserves created by the super productivity of the group. That is how wise charity has been funded in one way or another since the beginning of time. Sustainable Prosperity is a big new vision, but creates a true win/win/win at the highest levels and it is more than worth the effort and extra creativity needed. Sustainable Prosperity for all also creates a far greater sense of meaning, satisfaction and wellbeing in the lives of those who practice it. The principles of Sustainable Prosperity also will eventually lead to the end of most war and crime. This is simply because Sustainable Prosperity maintains our supporting ecosystems and satisfies most of a human's needs listed on theMaslow’s Needs Hierarchy. Most people, when given the chance, find deep value in being able to achieve more and increasing levels of Maslow's different need satisfaction levels in their lives. Research has shown that personal life satisfaction is near highest in individuals when basic physiological survival and safety needs are initially met. Life satisfaction goes a tiny bit higher on this a satisfaction bell curve graph when just a few extra comforts or luxuries are added. 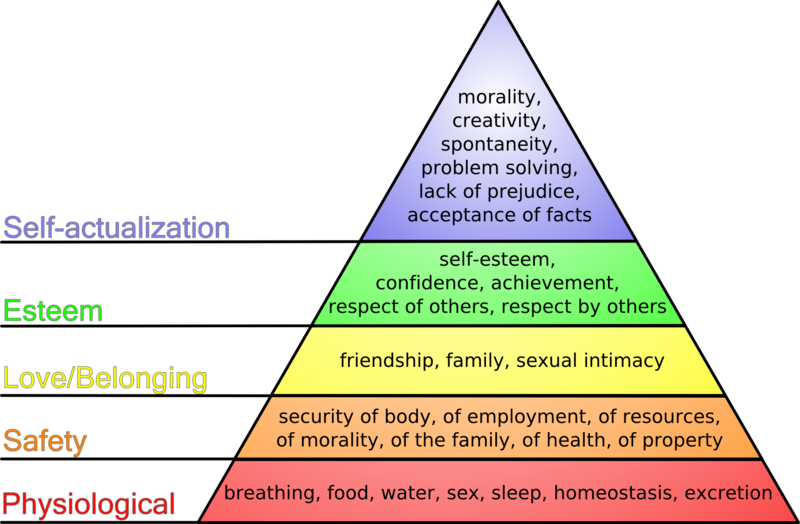 The satisfaction level drops steeply when over-consumption occurs and people seek non-essential material needs instead of pursuing the fulfillment of their higher needs on Maslow’s Needs Hierarchy. One of the greatest beauties of sustainable prosperity is that through meritorious, fair, and appropriate productivity exchanges and wise maintenance of our essential and supporting ecosystems, we will create a lasting human civilization. (Here we are defining “lasting” in universe time frames--in which 10 million human generations is hardly even a blink of the eye in the 13.8 billion years of universe time). Before you go onto the next page, take some time to think about each part of the full definition and foundational concepts above that make Sustainable Prosperity a system that works. For some of the above ideas, all you have to do is agree with their general premise and start to live them in any way you can. You will also get help with implementing these ideas in your lives and businesses as they are embedded into many of the practices and actions that you will be reading about in the following pages this online booklet. For now, all that is important is for you to have some familiarity with the depth and breadth of the concepts behind Sustainable Prosperity. Next, you will read about the secret problems in the global job market. This will set up the pages after that where you will learn about the hundreds of millions of new, good paying jobs that Sustainable Prosperity will create. Keep reading this online Sustainable Prosperity booklet by clicking the links below.